Fake news isn't always easy to spot. Be prepared to fact-check claims that you come across, and pay attention to where the information is coming from. 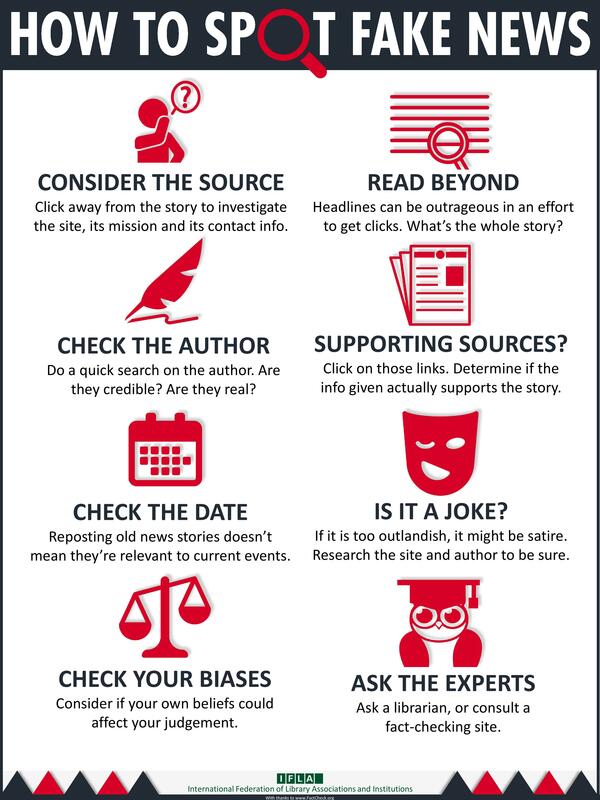 Use the tips on this page to learn how to identify bias as well as how to evaluate news articles and sites. "Evaluating Sources for Credibility." North Carolina State University Libraries, published on YouTube 9 June 2015. https://www.youtube.com/watch?v=PLTOVoHbH5c﻿. Fact-checking websites can help you investigate claims to help you determine whether what you hear or read is true. These resources can help you determine the legitimacy of a claim, but even fact-checking websites should be examined critically. The Poynter Institute serves as the world’s leading resource for journalists to engage and inform the public in democratic societies. Curious how well you spot fake news? Test your skill with this game, from American University.